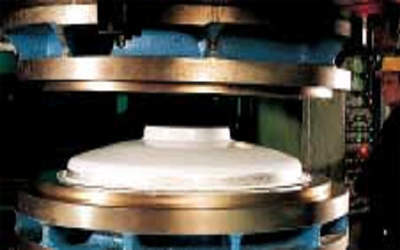 VRI Distribution provides a wide range of standard dished ends, vessel heads (torispherical, elliptical and flat), cones, hemispherical heads, and other stamped parts for pressure vessel industries, and all types of metal containers or tanks for various applications, especially those within the chemical industries. 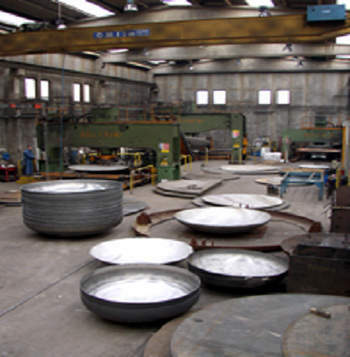 VRI Distribution has been serving the French market for ten years with several industrial partners and is able to manufacture parts with diameters from 30mm to 8,000mm and with thicknesses from 2mm to 60mm. The material to be employed can be supplied on consignment (the customer supplies disc or sheet metal) or completely supplied by VRI. 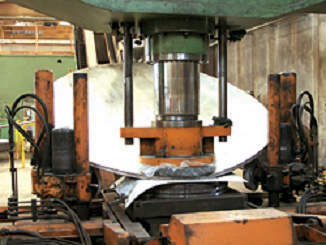 The cutting of the disc is done mechanically using oxygen lance cutting if the sheet metal is made of carbon steel or using plasma for stainless steel. Our welding operators are licensed professionals who follow formally established procedures and are qualified by institutions like TUV, ISPESL and Bureau Veritas. 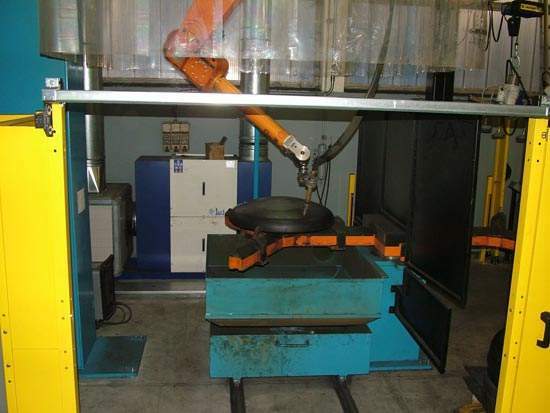 The manufacture of dished ends plates and other stamped parts is done with a portal oil-pressure press with one central cylinder, equipped with a semi-automatic manipulator with the possibility of automatism for the movement of the disc. Male and female moulds are assembled on the central part, carefully chosen as a function of the convexity ray required. On the female mould, shims are inserted and eventually removed when the disc takes the shape of a cap and arrives at the form required. A check of the shape is made against a template previously constructed as requested on the working bill. For small and medium sizes (up to 1,600mm) and series, presswork is made using hydraulic and mechanical stamping machines from 1,000kN to 16,000kN with variable power. 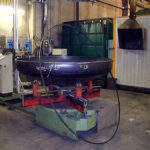 All presses can use dedicated automation systems to guarantee maximum production efficiency. Beading is done with an oil-pressure hemmer. The shape required is created through wiping and pushing the beading roll that composes the cap near the shape roll. 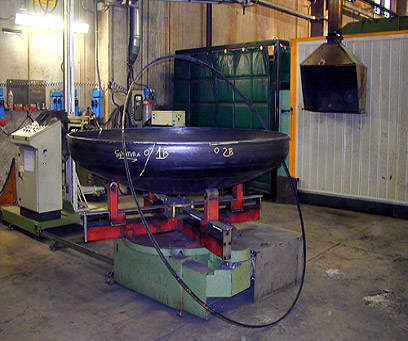 When the work is completed, the ray achieved is checked against a template previously built and the bottom circumference is also carefully checked. This work is done with a plasma torch and wheel using a horizontal positioner. 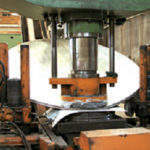 At our discretion and upon a customer’s request, rim machining can be executed using a machine tool. 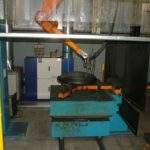 A robotized plasma cutting machine can execute any specific holes on request. After the treatment, the material must be gauged and arranged in order to pass on to the next set of checks. Every product manufactured by VRI Distribution is thoroughly tested for quality control. We perform all required dimensional tests and we take all the sizes and the rays required. In addition, quality technicians use an ultrasonic check to measure the final thickness achieved. These checks are usually made by our staff, and if required in the presence of outside collaborators of different institutions as required by the client. In addition to the quality certification UNI EN ISO 9001:2000, the company has several product validations, for example: validation TÜV AD2000 W0.